Paul Manafort is an advanced student of political coups. The veteran GOP fixer has, over the years, whispered in the ears of ousted foreign leaders like Ukraine’s president Viktor Yanukovych. Now, Manafort is doing the overthrowing himself. The 67-year-old operative, whom Donald Trump hired last month to oversee the campaign delegate-getting operation, has displaced Corey Lewandowski, Trump’s embattled campaign manager. According to interviews with five sources, Manafort is now firmly in charge of all major aspects of Trump’s campaign (at least as in charge as anyone can be with a candidate like Trump). Over the past week, Manafort has gained control of an expanded $20 million budget, hiring decisions, advertising, and media strategy — domains that had been exclusively Lewandowski’s. “It’s pretty clear that Paul has taken over the campaign,” one senior staffer told me. Most importantly, Manafort reports to Trump. Not surprisingly, Lewandowski has not ceded power willingly. And several people described the mood inside Trump’s campaign as a “civil war.” “It’s Manafort vs. Corey,” one source close to the campaign said. Manafort’s camp includes his longtime deputy Rick Gates; Rick Wiley, Scott Walker’s former campaign manager, who joined Trump earlier this month; and Roger Stone, a former Manafort business partner who continues to advise Trump informally. Lewandowski’s core team includes deputy campaign manager Michael Glassner, press secretary Hope Hicks, and adviser Alan Cobb. In recent days, there have been “blowups” on emails over budget matters between Lewandowski loyalists and Gates. Yesterday, Trump’s national field director, Stuart Jolly, a Lewandowski backer, quit after being told he would report to Wiley. Manafort and Lewandowski did not return calls for comment. The shift of power from Lewandowski to Manafort began from the moment the latter arrived on the scene, in late March. Manafort exudes authority, even down to the way he calls the candidate “Donald” (Lewandowski says “Mr. Trump,” even in private). Manafort also developed a bond with the Trump family. “Paul has a robust relationship with Jared, Ivanka, and the boys,” a staffer says. The takeover was cemented over the weekend when Manafort called a senior staff meeting at Trump Tower. The meeting, first reported by Politico, and which I confirmed, sent a message to staff that Manafort, not Lewandowski, is making decisions. Shortly after 8 a.m., Manafort gathered the advisers in the 25th-floor conference room. Manafort sat in the middle of the table; Lewandowski sat toward the end by the door. According to one person briefed on the meeting, Lewandowski spoke only for a short time about how Trump supporters take up too much time snapping photographs of the candidate on the rope line after rallies. Trump made a brief appearance at the meeting, which staffers interpreted as him blessing Manafort’s authority. When he left for a rally upstate, Lewandowski joined him while Manafort continued the meeting. 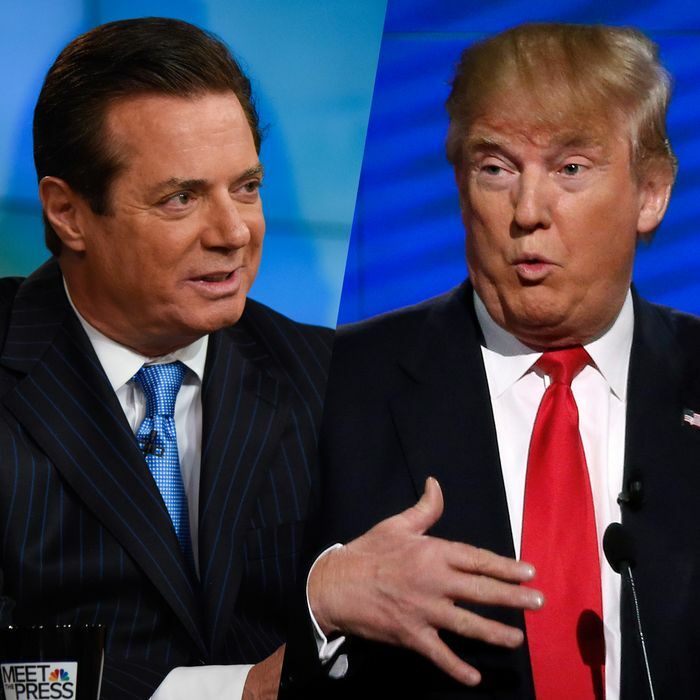 For Trump, Manafort’s ascension has both advantages and drawbacks. Trump has clearly become a more disciplined candidate in the time Manafort’s been on the scene. There’ve been fewer errant comments about abortion or NATO and fewer embarrassing tweets. “He’s calling Manafort like 20 times a day,” one person close to the campaign says. This is important, as Trump can’t afford unnecessary scandals as he attempts to reach the magic number of 1,237 delegates while girding for a contested convention. But a consequence of a newly professionalized Trump is that he could lose the insult-comic style that his fans crave. Insulting Heidi Cruz might be terrible politics, but it’s red meat for Trump’s audience. In the meantime, Lewandowski will continue to travel with Trump and focus on advance work, the task for which he’s most qualified. But sources say things could get rough for him in the weeks ahead. Manafort and Gates are currently poring through the campaign’s financial records. “Every expenditure that Corey approved is being reviewed,” one source said. The speculation, sources close to the campaign say, is that they may be looking for ammo to take to Trump to show him that Lewandowski mismanaged expenses. People who know Trump best say there’s probably one thing he dislikes most: wasting money.